I’m hoping this Week’s Tip can catapult you back into creativity and get you sewing again. Or at least excited about it! This is a brand new find – an APP – that’s perfectly made for making sense out of any kind of sewing stash you have. We all know how much fun it is shopping for fabric and patterns, right? Well, as your any stash grows, it can tell you a lot about your sewing interests, passion, and ambition. This same collection of sewing stuff you have can make you feel overwhelmed and maybe even frustrated. Making you feel like you haven’t used it like you hoped you would. But what if there was a way you could sift and sort through any stash so that you could take full advantage of it … and stay excited and motivated to sew with it? Today’s tip will help you get there! I'd be going to the fabric or craft store for something other than a sewing project I was working on ... like for my kid's school projects. While I was there, I'd see a pretty fabric on sale - something that I really wanted - even though I didn't know what I would make with it. So I didn't know how much I should buy. Then I'd buy 1.5 to 2 yards of it, usually - depending on the price tag. When I'd get home, I would realize I could make a skirt to go perfectly with a blouse that I had fabric for. And it dawned on me that I couldn't make it because I didn't have enough fabric. I just didn't buy enough. Another kind of thing that would happen is that I'd go to the store, and not remember what kind of or how many notions I needed for my next sewing project. You know, things like interfacing, zippers and buttons. Well that won't happen to me anymore. Today's tip is about the FREE APP that is practically built for people who love to sew with problems just like this! I'm so excited about it! Now picture being able to see every bit of it ... wonderfully filed away on your teeny tiny SmartPhone! This tool, appropriated for sewing, will help you move on your projects because you'll be prepared with all you need to know, when you need to know it! You'll be ready when the sewing mood strikes or the shopping opportunity knocks. And that's the biggest win!! So this is how it works . . .
You can take a photo of your fabric and add notes for widths, yardage quantity, and care requirements. You can take a photos of the front and back of your pattern envelopes for handy reference. You can add an image of your fabric to the pattern board to start a project mood board. You can take a photo of an unfinished project and add notes for what else you need. Start different files for your fabrics, patterns, projects, and even make a file for your client's projects! Add shopping notes, check boxes, and even just a quick note to self. Download this app and try it out. I think the excitement in using it alone might just get you out of your sewing rut. It worked for me. Most other note-style apps are too clumsy for our visually creative sewing intentions. Are you feeling stuck? Having a rough time getting yourself excited to sew again? We can all agree how it feels being stuck in highway traffic moving at a snails pace when we'd rather be closer to our destination. It really stinks! Well, sometimes you just get stuck in a sewing rut, and it feels pretty much the same way. Today I'll show you how to get into the faster sewing lane and stay there more often. When you're stuck, it can be a good thing. It causes you to realize and know very well what you don't want, so you automatically can think of something better. You can easily think of something you'd prefer instead. When we get stuck, the problem is that it's hard to figure out how to get un-stuck. But what if you could be completely out of that rut tomorrow based on just one simple decision you could make today? Everything that happened in the past is what got you to where you are today and what you decide today is what will for sure get you to a different and better tomorrow. I loved running into problems because I had to be inventive and learn a new way to make something work. And it was for me to do that. When I did find time to sew for my own enjoyment - those short spurts of time when I wasn't sewing for my clients, I felt rushed. That's usually when I made mistakes. Things ended up unfinished or I just hated what I was making. Those things that wouldn't normally annoy me when I sewed were becoming headaches instead of opportunities. So then I would go into a holding pattern. And it was hard to get myself out. But then I started to tune in to myself. I thought about what was really bothering me about my sewing work - which had grown out of my sewing hobby. My sewing hobby was what I had less time to enjoy now that I was hiring out my sewing skills. When I got into thinking about those irritations, I discovered a few things. And I know that the exercise helped me get myself out of the sewing funk that I was in. What I created was my: Sewing Code of Ethics. My ethics guide me in everything I do professionally and creatively with sewing. Having this set of ethics to help me get out of my funky rut ... is such a relief. Why? Well, now sewing anything that falls under my Sewing Code is so much more rewarding. It's like that by default. So what's a Sewing Code? This code is like that set of rules you live by. You've have them, but you just developed them slowly over the course of your life. Things like that. 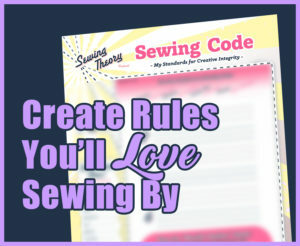 And your Sewing Code is the Set of Rules that you will sew by. You only have to start with one rule. That will give you enough of a boost to lift you out of your sewing stagnation. It'll add some moxie to your attitude. Time you will carve out to sew - every month, or every week, or every day. Way in which you make something - using materials, methods, or level of mojo. You're only thinking about this to help you know what you'd rather do. It's like a game. My daughter, Marielle, used to play a game with her friends in 3rd and 4th grade called "Would You Rather?" and it's funny to hear kids play it. "Would you rather eat cold pizza or melted ice cream?" "Would you rather make quilts or make dresses?" And of course, you could change it up to fit whatever you have experience with! Would I rather work with people who bring me small things to work on regularly or work on bigger more complex things that span larger chunks of time? Would I rather sew with organic natural fabrics or sew with whatever strikes my fancy? And just keep going, asking yourself, "Would I rather this or that?" until you're thinking more about what you really want to experience and to gain from all of your sewing efforts. "I only work with people who appreciate the amount of time, consideration, and workmanship that I invest in designing and making things expressly for their home environment." "I charge for my time as a professional, because my knowledge, technique and expertise within interior design, drapery and soft furnishings are skills that have been cultivated over time, and is continually being amassed." "I devote at least one weekend per month (without interruption) - 5 hours Saturday, and 5 on Sunday to work on something just for me." Of course, this is something I have to work out with my husband, my mom, or time-trading other moms, or planning around kid activities so I can carve out the creative time. It means I'll be happier all month because I look forward to that time. This ethics thing was a big teaching point for Zig Ziglar, one of the most respected personal development gurus. He passed away years ago, but his teachings have helped over 250 million people worldwide ... and still do. "When you have ethics you never have to compromise your integrity." So do the right thing and shore up your personal sewing policy - your ethics - and develop your own Sewing Code. If you are running a sewing based business, you should do this same exercise for your business. Have a code, and you'll be able to feel more trustworthy. Best of all, you'll trust yourself more to make decisions! You'll even be able to stay passionate and committed to your projects. Your Sewing Code shapes where your creativity will ultimately take you. And when you know it, you won't be SNIOP-ed. What does it mean? It relates to being Susceptible to the Negative Influences of Other People. I don't mean negative in a bad way, I just mean that the negative influence is what could draw you away from what you hold dear to you. From your sewing ethics. Your code. If your ethics feel good to you - and they should - then you'll be able to shield yourself. And the only way to avoid being SNIOP-ed is to know your Sewing Code and take it to heart! So what else do you need to do? Download the worksheet for this episode. You can write up your own code and keep it visible. The holidays are a good time to think about and develop your code, because we often take on more than we should. Or veer in a direction off the chosen path and feel bad because of it. Your Sewing Code will help you make better choices this holiday season. And make sure to revisit your code every 6 months. Your interests might change, and you can modify it over time. Print it and Place it somewhere you'll remember - pin it up, or use it as a screen saver. I'd love to hear what your ethics are, so drop me an e-mail. Let me know what's getting you out of your rut! Georgia O'Keefe - "To create one's world in any of the arts takes courage." So lift yourself out of the rut, know who you are and sew by your own code. Be courageous and take a stand for yourself!! I'm on your side. Take that step forward -- practice your sewing art like you really mean it. Join us next week when we talk about Branding: "To brand or not to brand? That is the question."